St Govan?s (or Gowan?s) Head is a promontory at the south extremity of Pembrokeshire, six miles south of Pembroke itself. Hidden by the rocks to the right of the present watercolour stands the ancient chapel of St Govan?s ? this view relates closely to a watercolour by Gastineau entitled ?St. Gowan?s Chapel? which was engraved for ?South Wales Illustrated?, published in 1830. In the engraving however, Gastineau, presumably for picturesque reasons, does not include the chapel itself and the viewpoint is slightly different. Gastineau exhibited ?Chapel at St. Gowan?s, Pembrokeshire? 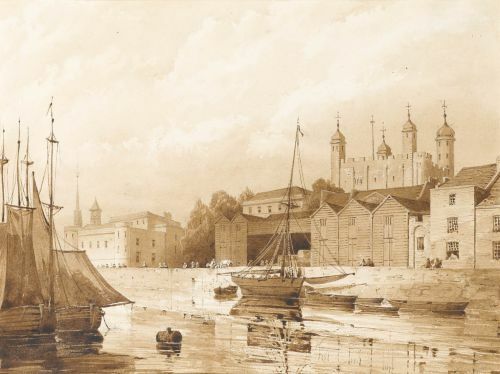 at the Society of Painters in Water-colours in 1844, no.195. We are grateful for Tom Lloyd for his comments on this picture. 289 x 393 mm., 11 ¼ x 15 ½ in. 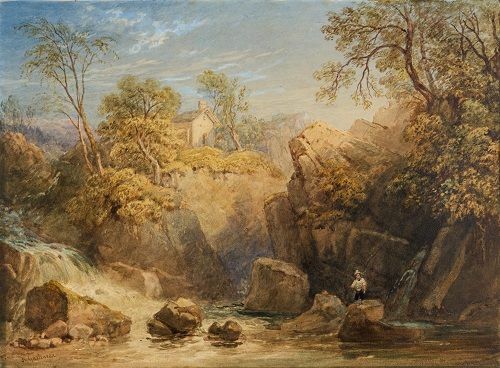 Gastineau exhibited `Hawthornden, near Edinburgh’ at the Society of Painters in Water-colours in 1825, no.178, but stylistically this watercolour is more likely to date from the 1830s.